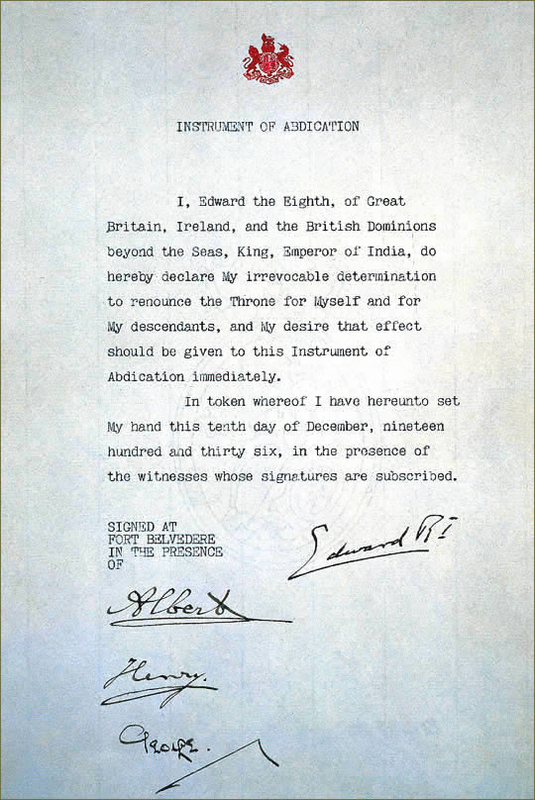 Seventy-seven years ago, in a move unprecedented since the Glorious Revolution of 1688, King-Emperor Edward VIII abdicated the throne. Today’s audiences will recognize the episode from The King’s Speech: less than a year after having ascended to the British kingship in January of 1936, Edward became romantically entangled with a yet-to-be-divorced American socialite named Wallis Simpson. As long as the King’s liaisons remained discreet, the couple was afforded a respectable amount of privacy by the royal family and the British media. Things grew more complicated, however, when Simpson divorced her second husband in October of 1936, and the pair decided to marry, come hell or high water. A King of the United Kingdom of Great Britain and Northern Ireland being wedded to a twice-divorced American socialite would have caused a furor. As the head of the Church of England, Edward could not marry a divorced woman whose former husband (let alone husbands) remained alive. Simpson’s first divorce proved even more problematic—it was granted based on “emotional incompatibility,” and may not have been recognized under both Church and English law. The King’s marriage to Simpson also raised the possibility of an American Queen, a sacrilegious idea in the eyes of his subjects. For those who had doubts about Simpson’s true feelings for the King (some suspected her of caring only about the king's money), the next 35 years would provide sufficient proof. The pair remained married until Edward’s death in 1972.